10 | TH E M R EP O RT MCROWD RICK METSGER President Barack Obama has appointed National Credit Union Administration (NCUA) Board Vice Chairman Rick Metsger to be the ninth Chairman of the NCUA Board. Metsger joined the NCUA Board in August 2013, and the Board unanimously elected him as Vice Chairman in September 2014. During his tenure as Vice Chairman, Metsger has focused on modernizing regulations and the federal credit union charter in order to provide credit unions with greater flexibility to innovate and grow as well as regulatory relief. Prior to joining NCUA's Board, Metsger served in the Oregon State Senate from 1999 until 2011. He was elected Senate President Pro Tempore in 2009. CHAD MOSLEY Mortgage Contracting Services, LLC (MCS) announced the formation of MCS Solutions. Chad Mosley, who joined MCS in 2008 as AVP of Business Development, and has served as SVP with the company since 2012, has been promoted to the position of COO of MCS Solutions. In his new role, Mosley will assume executive responsibilities for MCS Valuations, MCS Title, and Vacant Property Services. For the last four years, the company has grown substantially as Mosley has overseen business development efforts, industry relations initiatives, and corporate expansion in his role as SVP. ELIZABETH FOSTER Invitation Homes added Elizabeth "Jiggs" Foster as SVP of Marketing. Most recently, Foster was with Trion Consulting, a boutique firm with clients that included Johnson & Johnson, McKesson, and Abbott Labs. Invitation Homes has also added Holly Costello as VP for Operations with responsibility for Central and North Florida (operational oversight for approximately 6,000 homes). Costello's most recent position before joining Invitation Homes was VP of the Multifamily Division and VP of the Navy Military Division of Balfour Beatty Communities. JON W. GERRETSEN Altisource Portfolio Solutions S.A., named Jon W. Gerretsen as President of Altisource Origination Services. Gerretsen joins Altisource with over 25 years' mortgage and consumer banking experience—specializing in providing strategic execution of services, processes, and products. Gerretsen was most recently the First SVP for the Mortgage Banking Division of New York Community Bank, responsible for residential mortgage operations for NYCB's retail, wholesale, and correspondent production. Prior to NYCB, Gerretsen held senior leadership roles in mortgage banking and services for various organizations, including AmTrust Bank, CitiMortgage, Inc., and KPMG. COLLEEN LAMBROS Ten-X welcomed Colleen Lambros as Chief Marketing Officer for its residential division. Lambros will report to Jason Allnutt, General Manager of Ten-X's residential division. 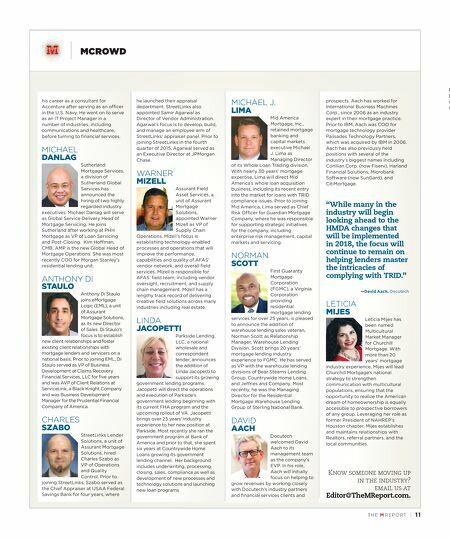 She will lead all marketing and branding efforts for the newly launched Ten-X Homes, a transaction platform that empowers consumers to do everything involved in the process of buying or selling a home entirely online—and Auction.com, the company's online marketplace exclusively focused on the sale of residential bank-owned and foreclosure properties. Lambros has more than two decades' real estate industry experience. She comes to Ten-X from The Irvine Company, where she held several leadership positions in sales and marketing over a span of 15 years. ED KRAMER Ed Kramer has been added to Treliant Risk Advisors' Senior Advisory Board. Kramer brings with him the knowledge, skills, and relationships he has built across the financial services industry during his decades of experience as a regulator, bank executive, and recognized industry advisor. He is currently an Independent Director on the Mortgage Electronic Registration Systems, Inc., Board of Directors. His previous positions include EVP of Regulatory Affairs at Wolters Kluwer Financial Services and he has worked as a Deputy Superintendent of Banks, First SVP of the Dime Savings Bank of New York, and head of the Consumer Services Division at the New York State Banking Department. JENNIFER RAIMER Cityside Management Corp., promoted Jennifer Raimer to the position of President after serving as COO and Chief Talent Officer for several years. As President at Cityside, Raimer will lead the company's strategic expansion plans. Those plans include two new contracts covering 3,000 homes and aggressive efforts to extend services and key government and private contracts beyond the 45 states already served by the company. CISCO GONZALEZ Ernst Publishing Company announced Cisco Gonzalez as Director of the Project Management Office. In his new position, Gonzalez will manage project management company- wide. Previously, Gonzalez was VP, Business Liaison Consultant at Wells Fargo. He started at the national bank in 2011 as AVP, Operational Risk Consultant. 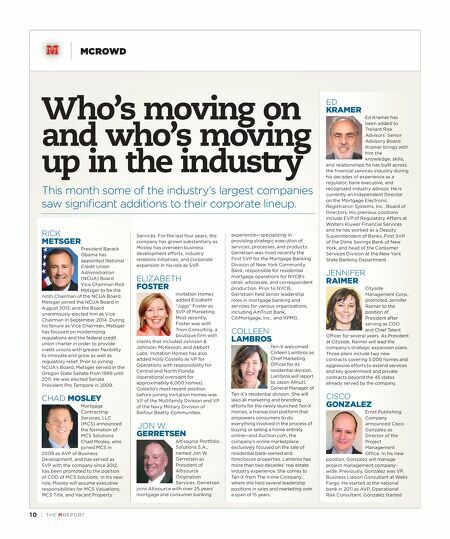 Gonzalez started Who's moving on and who's moving up in the industry This month some of the industry's largest companies saw significant additions to their corporate lineup.